Page Street Publishing, 9781624144431, 192pp. 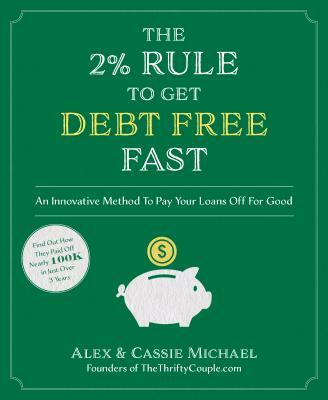 In The 2% Rule To Get Debt Free Fast, Alex and Cassie break down the steps that took them from over $100,000 in consumer debt to living a debt-free life in just a few short years. Alex and Cassie's step-by-step plan is for even the most financially illiterate, and has helped thousands of their followers on their website, TheThriftyCouple.com, get their finances in order. Complete with personal anecdotes, helpful worksheets and money-saving tips and tricks, The 2% Rule To Get Debt Free Fast has everything you need to live a life unencumbered by debt. Alex and Cassie Michael are the founders of the popular blog TheThriftyCouple.com, where they have helped hundreds of thousands of fans with their finances. They live with their six children in Utah. "This smart and reliable book can help anyone who owes money, or who just wants to get control of their finances. If you want to change your financial life, get this book." "If you feel like you are drowning in the bills, this book is a solid investment and a lifeline. The 2% concept will help transform you to solid financial footing. I would recommend this book to anyone!" "Alex and Cassie have been inspiring others to improve their financial lives for years. It's exciting to think of how many more people will benefit from their hard-earned wisdom by implementing the realistic approach to becoming debt-free that is detailed in their new book!" "Alex and Cassie's method provides hope for those who understand the pain and frustration of paying off their debts. If you are looking to change your financial future, this is definitely worth checking out." "This is a down-to-earth read that stirs up a desire to leave the broke status-quo for debt-free freedom."